So, the trolling begins apparently, on April 1st this page was created as a joke. 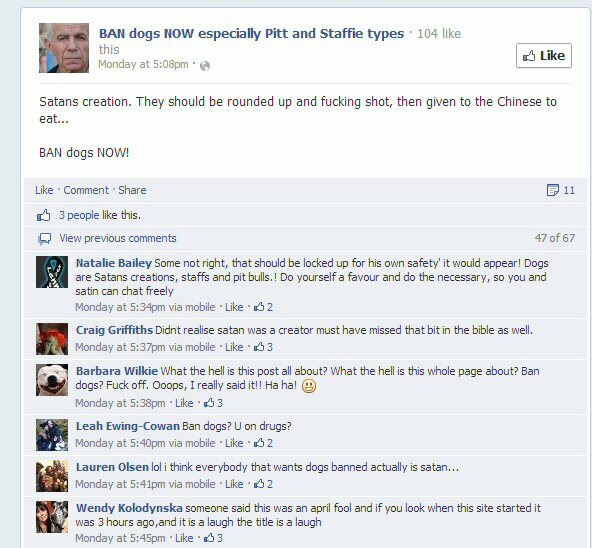 I assure you it is not a joke, these "trolls" continue to do these pages to annoy those who advocate for the Pit bull breed. 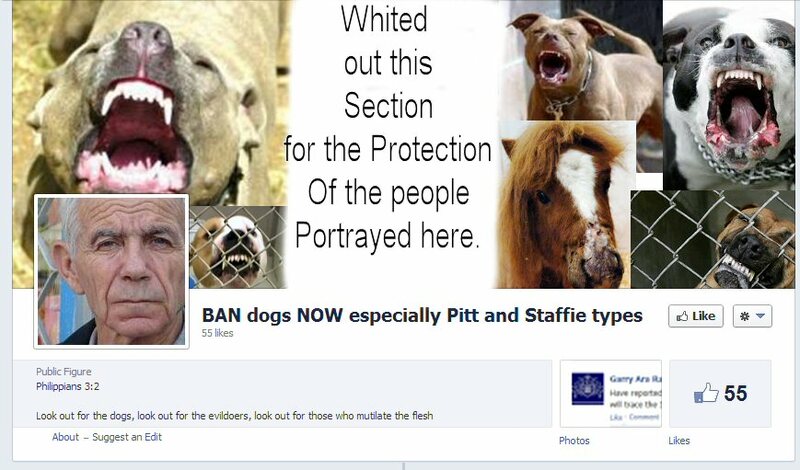 That is all they are to me, a little pest with nothing better to do, but spread untruths about the pit type breeds. They get their statistics from dogsbite.org, which by now many people have come to realize that the owner/founder of that site is no dog expert and because of her malevolent ways dogs have been suffering. 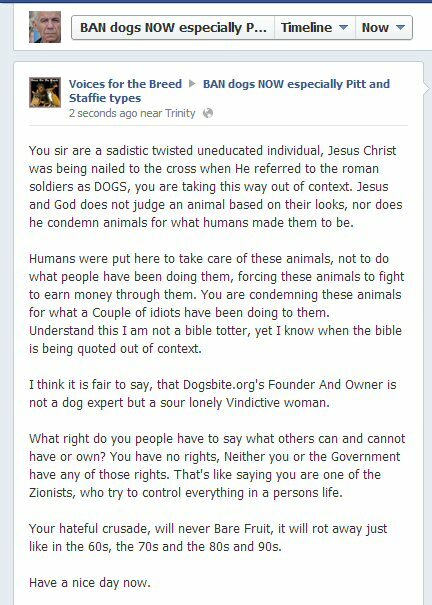 This page owner takes quotes from the bible and twists the meaning of the verses. This was stated by one of our admins at the VFTB, which by the way very well stated my dear. 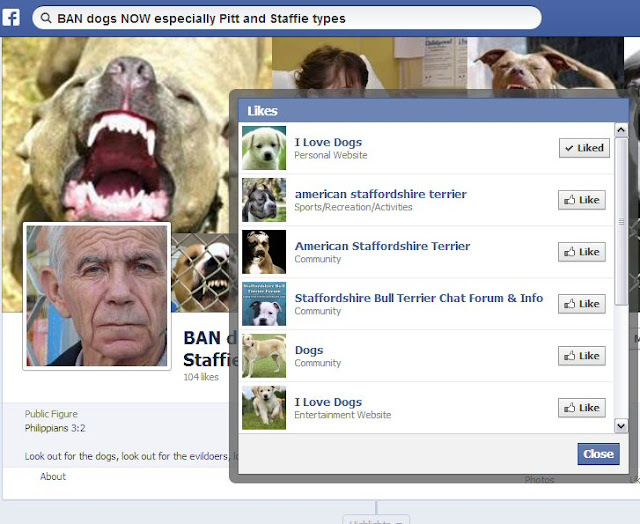 This is mind boggling how this page owner can like Advocate pages that speak for this breed. Oh that's right they like these pages to keep track of what we STATE on our pages. Do you guy's have a life, or do you Troll the internet for a living? 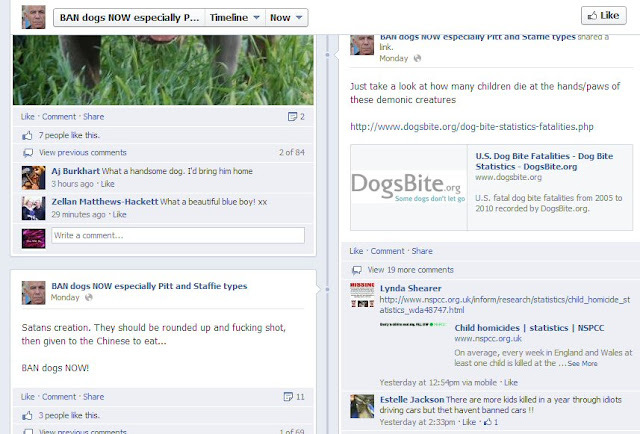 As you can see this page owner is linking to an out of date bite statistic that is found on Dogsbite.org. Which might I add none of her statistics are up to date. For him to bring up Satan as a creator is moronic, Satan is a fallen from grace angel and has been left in charge of as well all know Hell. People like these Pit haters love to try and convince everyone else that never had this breed of dog that these dogs are monsters. All dogs no matter what breed is a reflection of their owner, If you have a vicious dog you have an owner who showed no kind hand to their dog, nor did they properly socialize or train their dog. The one thing I have an issue with is those who defend a page that cause harm in the media sense to these breeds who have had no choice at what owner they get. As I have stated before, the media and some people can't tell the difference between an APBT or a white boxer. With all those supposed dog attacks out there, How many do you really think was caused by an APBT? Not many only 5% were by APBT'S and those 5% were due to the fact that they were trained to be aggressive toward another dog and or human. And out of those %5 some have been rehabilitated and have become therapy or K-9 officers. If you see more pages like that one, please do not hesitate and let us know. We are still working on the details of who owns this pathetic Hate page.